This miniature dollhouse detail is a 1:12 scale Famous Amos chocolate chip cookie box (empty). 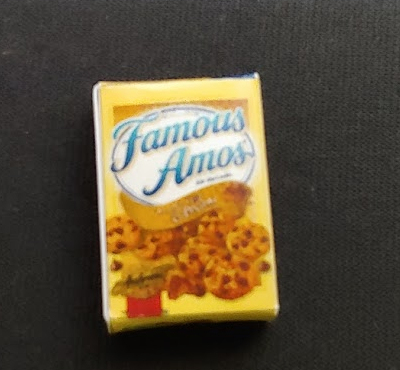 The miniature Famous Amos chocolate chip cookie box is printed on all sides and measures 0.983" x 0.57" x 0.25". This Brand Chocloate Chip Cookie Box is supplied by Cindi's Minis, which generally ships within 1 business day(s) of you placing your order .